May 2018 has been extraordinary for its high volume of establishment press corrections and erroneous tweet deletions. One particular correction at the New York Times stands out from the rest of that crowded field. 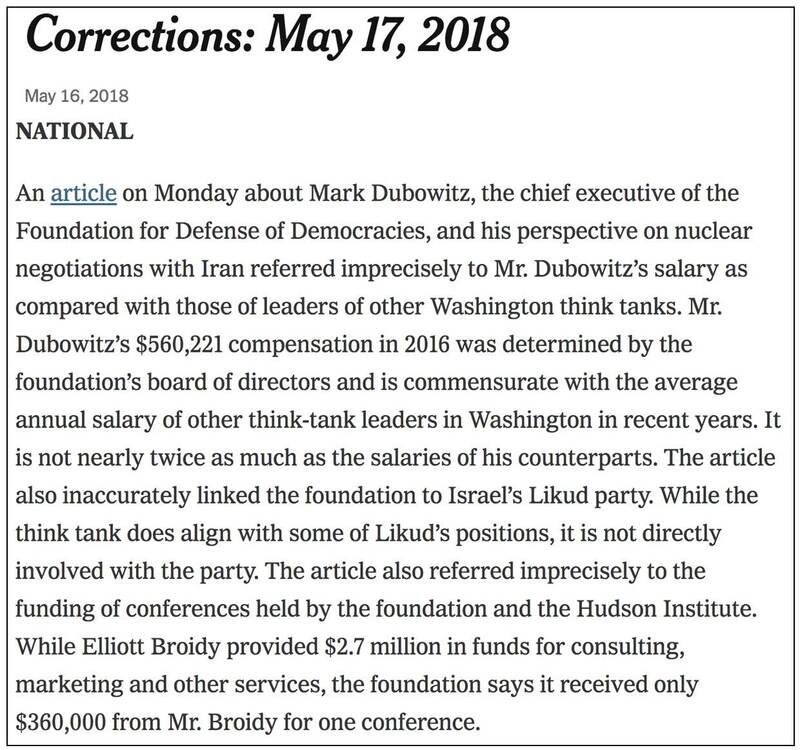 In that correction, published on May 16 (for the May 17 print edition), the Times admitted that reporter Gardiner Harris committed four significant errors in an attack piece posing as a hard-news story about Mark Dubowitz, the chief executive of the Foundation for Defense of Democracies think tank. Dubowitz was a strong opponent of former President Barack Obama's Iran nuclear "deal" in 2015, but then tried and failed to salvage portions of it before President Donald Trump's announced the United States would withdraw from it earlier this month. Harris's piece is uniquely embarrassing, both for its sheer volume of errors and for how easy it should have been for his editors to catch them. (First, in first highlighted section) Harris clearly wanted to portray Dubowitz as someone milking a not-for-profit and living the high life with no accountability, and committed two errors in the process. First, he, or at least his editors, should have known that, like other not-for-profits, the Foundation for Defense of Democracies has a board which approves executive salaries. (Second, in first highlighted section) Additionally, Harris incorrectly contended that Dubowitz's salary is "nearly twice as much" as his counterparts. How he did that is a mystery, given that there is an annually published think tank salary survey containing specific detail. After these first two corrections, there's no real news in Harris's corrected sentence, suggesting that it should have been deleted, or at least that it would have never appeared if he had his original facts correct. 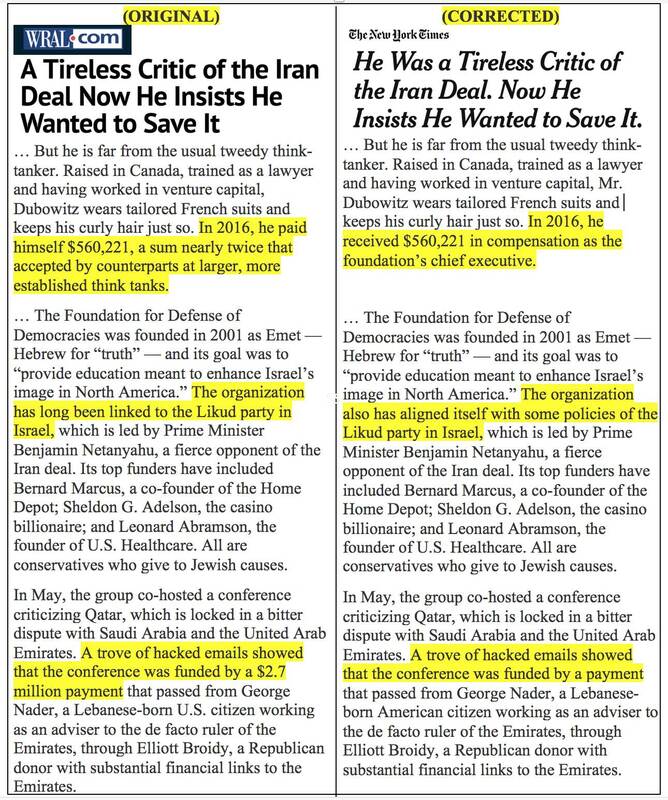 (Third) Harris's false Likud linkage appears to be the product of a rampant conspiracy-theory mindset at the Times and a stubborn track record of accepting lies about the Middle East as facts. For example, in late April it had to correct a contention that Palestinians pay hundreds of millions of dollars in pensions to families of terrorists killed or imprisoned is "far-right conspiracy programming." It's not. (Fourth) The conference funding of $2.7 million originally reported dropped by over 85 percent to $360,000. The fact that the Times couldn't bring itself to report that far lower amount in the text of its corrected story likely indicates that the entire paragraph involved was also not genuinely newsworthy. It's also impossible to ignore the hostility seen in the opening portions of both the original and corrected versions presented above. Who except an angry, jealous, agenda-driven reporter would care about "tailored French suits" and "keeping his curly hair just so"? What's left after the corrections is a dispatch about a think-tank exec with no genuine public-policy power who originally opposed the Iran deal, thought he could convince Trump to mend it without ending it, and is now getting flak from fever-swamp leftists who didn't like his original opposition.